Vivo Y81 VS Vivo Y83: Vivo’s smartphones powered by Helio P22 chipset. 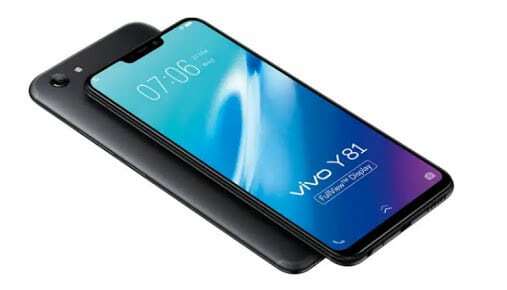 Vivo has released a new smartphone called Vivo Y81 for the Vietnam market. The smartphone will soon be available to other countries like China, Japan, Malaysia and Europe in the coming weeks. One of the highlights of the new Vivo Y81 is the Helio P22 SoC (System on Chip). But the smartphone won’t be the first from Vivo to be powered by the Helio P22 chipset. The Vivo Y83 which was released sometime in May 2018 is actually the first Vivo’s smartphone to be powered by the Helio P22 chipset. We don’t need a wizard to tell us that there’s a connection between Vivo Y83 and the new Vivo Y81. Even their names are closer than it could ever be. So we already know they’re both powered by MediaTek Helio P22 chipset. But what else do they have in common and what distinguishes them? Below is a detailed comparison between the Vivo Y81 and Vivo Y83. The design of the Vivo Y81 and Vivo Y83 is somewhat similar. They both feature a front glass with aluminum alloy unibody. The Vivo Y83 features a rear-mounted fingerprint sensor while the Vivo Y81 doesn’t. I have a feeling the Vivo Y81 is a slightly stripped version of the Vivo Y83. The new Vivo Y81 weighs 146.5 grams with 7.8 mm thickness while the Vivo Y83 weighs 150 grams and measures 7.7 mm in thickness. The Vivo Y83 comes in four body colors option; Black, Aurora White, Red, and Gold. While the Vivo Y81 is only available in Black body color. The single rear camera of both the Vivo Y81 and Vivo Y83 is aligned at the top left corner with the LED flash. The only major difference between the Vivo Y81 and Vivo Y83 is the design department is the fingerprint sensor that’s featured on the Vivo Y83. There are speculations that the Vivo Y81 will support face unlock soon. The Vivo Y81 and Vivo Y83 both feature the same 6.22 inch IPS LCD touchscreen, 720 x 1520 pixels resolution, 19:9 aspect ratio and 270 pixels per inch density. The display of the Vivo Y81 features an 83% screen-to-body ratio while that of the Vivo Y83 features an 82.7% screen-to-body ratio. The screen of both Vivo’s smartphones is protected by an unspecified version of Corning Gorilla Glass. Both the Vivo Y83 and Vivo Y81 features a 13MP rear camera with f/2.2 aperture and LED flash. At the front camera of the Vivo Y83 is an 8MP shooter with f/2.2 aperture. While the front camera of the Vivo Y81 sports a 5MP shooter with f/2.2 aperture. So here we’ve another major difference between both smartphones. Like I said in the introduction, the Vivo Y81 and Vivo Y83 is being powered by MediaTek Helio P22 chipset with an 8-core processor clocked at 2.0GHz and PowerVR GE8320 graphics processing unit. Running on both smartphones is Funtouch OS 4.0 skin, which is overlaid on Android 8.1 Oreo. The Vivo Y81 comes with a 3GB memory and 32GB internal storage. While the Vivo Y83 packs a 4GB memory with a 64GB storage for the Chinese market and 32GB storage for the Indian market. The Vivo Y83 comes with a non-removable Li-lon 3260 mAh battery. While the Vivo Y81 comes with a non-removable Li-Po 3260 mAh battery. There’s no sort of fast battery charging support for both devices. The Vivo Y83 is currently sold for about $291 (N101,850) while the Vivo Y81 is sold for $232 (N81,200). The main difference is the fingerprint sensor, better front camera, and increased memory space. Am not sure these extra specs on the Vivo Y83 is worth the extra $59 (N20,650). Let me know what you think in the comment section below.